About four months ago, I heard about another trauma program medical director who had to give a presentation about the open abdomen because of local politics at their center. They weren’t really asked. They were pretty much told they had to because staff were concerned–staff said they’d never seen those procedures done so often at their center. And the staff’s uncertainty was being stoked by some influencers who did NOT want trauma to succeed or grow. And guess what else: this was the third time I saw the scenario repeat in the last three months. Every time, the medical director was a good surgeon who had already done a lot of teaching about the use of damage control surgery and the use of the open abdomen before being “asked” to give that presentation. What was going on at the center was standard care delivered was being delivered in a standard way to patients who needed it. And it was being done at a center that knew it needed to improve. These medical directors had taken a role where a hospital service either need to be greatly improved or they had been asked to start that very service. But not everyone wanted it to succeed. Despite good intentions, dedication, and great training each director left the center less than a few months later. This made me start to wonder: how often does that happen? Then I started to consider sharing all of the themes I’d seen repeat across Trauma and Acute Care Surgery centers–the awesome ones that made for success and the horrible ones that helped yield collapse. 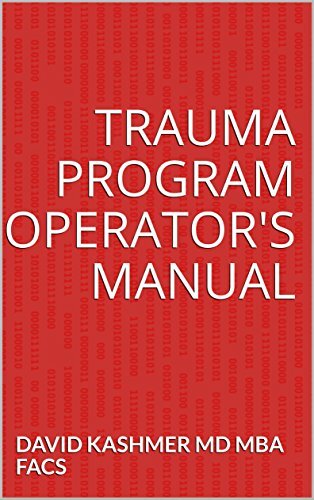 I decided to share a type of program manual (an operator’s manual) for anyone who participates in a trauma program in any way. It would include a lot more than the scenario that repeated so much and had tipped me off to write the book in the first place. Whether you want to learn about trauma finance, trauma process improvement, the common pitfalls seen when trauma “comes to town”, or one of the many themes that repeat across centers, the Trauma Program Operator’s Manual can answer many of your questions and accelerate your ability to achieve excellence in trauma care. If you’re involved with a trauma program in any way, this manual is for you. It’s filled with useful, hard to find info that helps guide your trauma program to excellence and beyond. Are you a Trauma Program Medical Director, Trauma Program Manager, nurse, ER physician, trauma registrar, practicing Trauma surgeon, or C suite member? This manual offers, in a conversational tone, specific tools and techniques from a previous Trauma Medical Director and Chief of Surgery. Interested in whether the culture issues you’re seeing with your Trauma program are normal? Wondering about specific quality improvement techniques in Trauma? Curious about audit filters and what they mean? 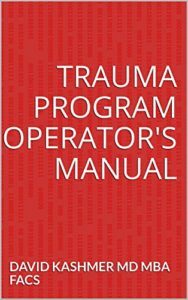 The Trauma Program Operator’s Manual contains hard to find info and more that helps your trauma program succeed. Source: Trauma Program Operator’s Manual – Kindle edition by David Kashmer MD MBA FACS. Professional & Technical Kindle eBooks @ Amazon.com.